Figure 2. 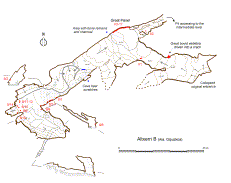 Plan of Altxerri B Cave, marking the position of the samples taken for radiocarbon dating. Figure 3. Relevé of the Main Panel in Altxerri B, after a photograph. Isolated finger marks (3, 4, 5, 6), a bison (7), a feline (8), a possible animal's head (10), a bear (14) and two groups of three finger marks (15, 16) are shown, as well as other motifs more difficult to interpret. Figure 5. Stylistic comparison. 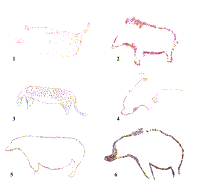 (1) Feline from Altxerri B; (2) bear from Altxerri B; (3) ‘leopard’ from Chauvet (from Clottes, 2001); (4) a panel from Chauvet with an association of a bear, a feline and two groups of three fingerprints, the same thematic as Altxerri B (from Clottes, 2001); (5) bear from Micolón (from Garate and González-Sainz, 2009); (6) bear from Arcy-sur-Cure (from Baffier and Girard, 1998).